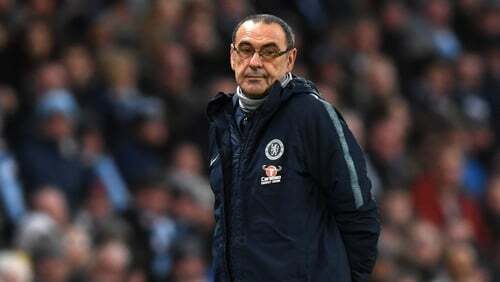 Chelsea manager Maurizio Sarri: "I think we started well then we conceded the goal after four minutes in a stupid way"
Maurizio Sarri feels he is "always at risk" of being sacked by Chelsea after watching them succumb to their heaviest defeat in almost 28 years. The pressure intensified on the Italian after Sergio Aguero's 11th Premier League hat-trick, Raheem Sterling's double and Ilkay Gundogan's goal wrapped up an incredible 6-0 win for Manchester City. A miserable day at the Etihad Stadium was Chelsea's worst result since losing 7-0 to Nottingham Forest in April 1991 and comes less than two weeks after a shock 4-0 hammering at Bournemouth. Sarri made an encouraging start to his tenure as Chelsea were unbeaten after their first 12 top-flight matches under him but the Blues have faded out of title contention and face a battle to finish in the top four. Their manager accepted he is concerned by their recent displays but gave a considered assessment when asked whether he fears for his future. He said: "I don't know, you have to ask the club. I am worried about my team, I am worried about the performance but my job is always at risk so I am not worried about the club. You have to ask the club. "I didn't see my football (against City). At the beginning (of the season) it worked. So now we need only to understand the reasons why at the moment it isn't working. We need to understand the reasons. "It is not easy. At the beginning, we played better away than at home. Now we are playing better at home than away. "Something is changing. At the moment I am not able to see the reason but I have to work for this because my target is to play my football, not to change another football because at the moment we are playing another football." Following the loss to the Cherries on the south coast, Sarri was openly critical of the mentality of his players and that he could not motivate them. They duly responded by thumping Huddersfield 5-0 last weekend but were once again thoroughly outclassed on Sunday afternoon. Sarri, though, did not think they were struggling for motivation this time. He said: "No, I don't think so. My feeling during the week was really very good. "My feeling was that in this match the motivation was at the right level. I think we started well then we conceded the goal after four minutes in a stupid way. "In that moment, we needed to stay in the match and we were not able to because we made a lot of mistakes against the wrong opponents. We have to say they played really fantastic football." Sarri, whose side slipped to sixth, did not shake the hand of his opposite number Pep Guardiola at full-time but insisted he was merely eager to return to the dressing room. He added: "I didn't see him at the moment but of course as usual I will go to say hello to him later as usual. "It was by chance because I wanted to go to the dressing room and at the moment I didn't see him. I have not a problem with Pep." Guardiola, too, played down any speculation of a rift as he said: "I spoke with (Chelsea assistant) Gianfranco Zola. (Sarri) didn't see me. I have a good relationship with him so no problem." The Spaniard empathises with the scrutiny Sarri is under and believes the former Napoli coach needs time to implement his ideas. Guardiola added: "I know exactly what he wants to do. This kind of person or this type of game always helps to make our football better. He wants to try to do that. "People don't understand how difficult the first year can be. Mine was difficult too. People expect with a new manager and buying players it comes immediately, but it needs time."